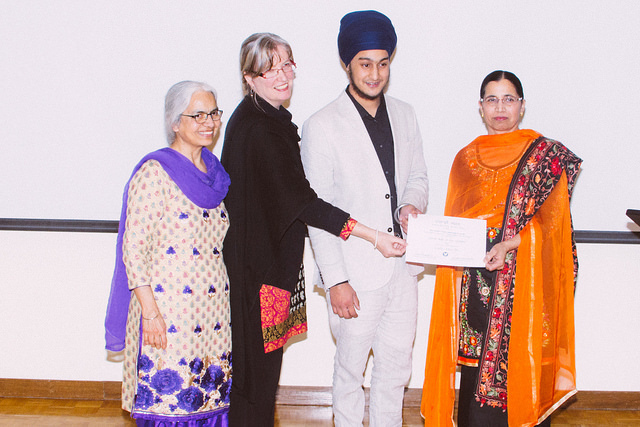 UBC’s annual Harjit Kaur Sidhu Memorial Program, which celebrates the life of Punjabi in BC and is now in its eighth year, was held on March 16-17, 2016. 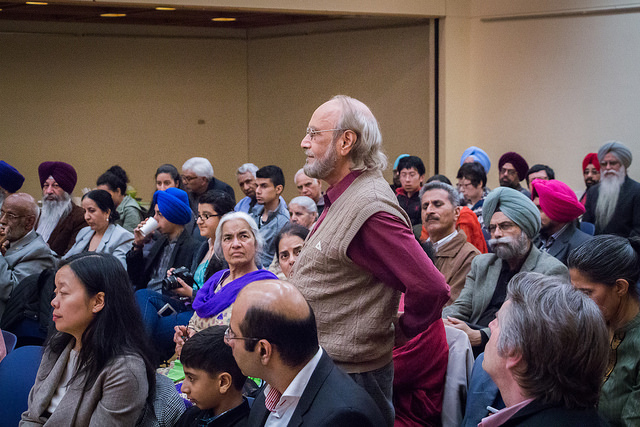 On March 16, we gathered to hear a short talk on the early twentieth century revolutionary Ghadar movement, which sought to establish a free and secular India and an end to British colonial rule, by Sunit Singh (University of Chicago); present awards to student winners in a Punjabi-language essay contest; honour BC-based Punjabi-language author Jarnail Singh Sekha with a life-time achievement award; and view performances in Punjabi by students in Punjabi 200 and films by students from ASIA 475, “Documenting Punjabi Canada.” The event was well attended by students and members of the community. 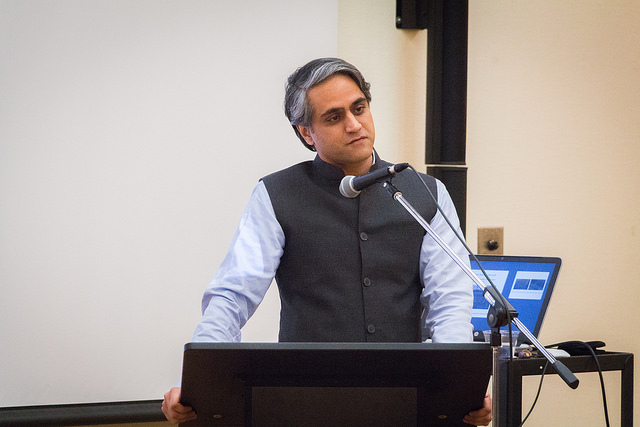 On Thursday March 17 at 4 p.m. we gathered to hear a longer scholarly talk by Sunit Singh about the connections between members of the Punjabi Canadian community and the Canadian Left. 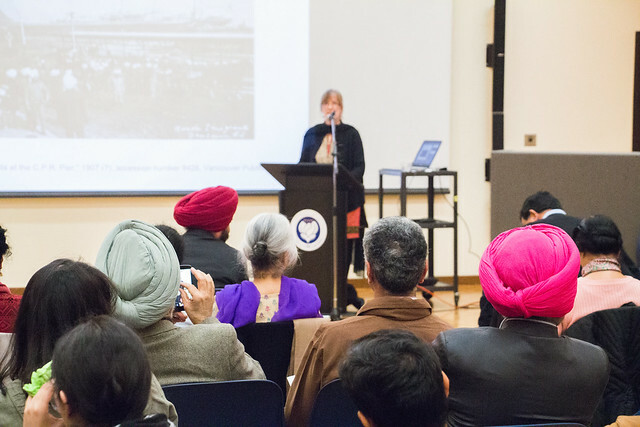 The Harjit Kaur Sidhu Memorial Program occurs every year in the Department of Asian Studies at UBC. It is designed to celebrate the rich life of Punjabi language and culture in BC, and to honour the people — writers, students, teachers, and scholars — who contribute so much to Punjabi’s legacy and present in this province. Congratulations to our essay contest winner! Our guest speaker, Sunit Singh (University of Chicago). A picture of local Punjabi language writer, Ajmer Rode, during the Q&A session. 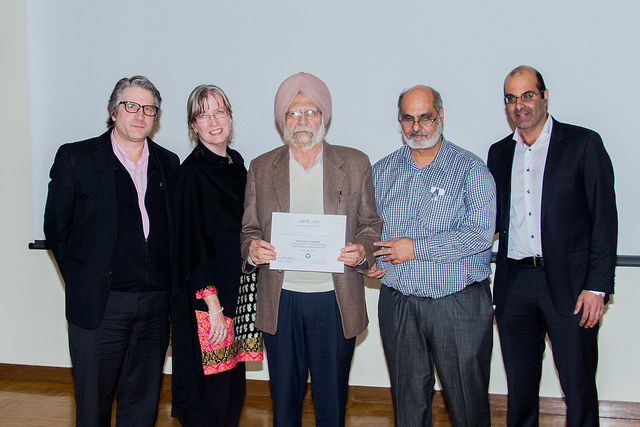 Jarnail Singh ‘Sekha’ (in centre) after he received the writer’s award, (from left to right)with Professor Ross King, Head of the Department of Asian Studies; Anne Murphy Associate Professor in the Department of Asian Studies and Chair of Punjabi Language, Literature, and Sikh Studies; Sukhwant Hundal, who teaches Punjabi in the Department of Asian Studies at UBC, and Dr. Ravi Sidhu, from UBC’s Faculty of Medicine, who established this annual program in loving memory of his mother, Harjit Kaur Sidhu, an advocate for women’s rights, education, and the Punjabi language. 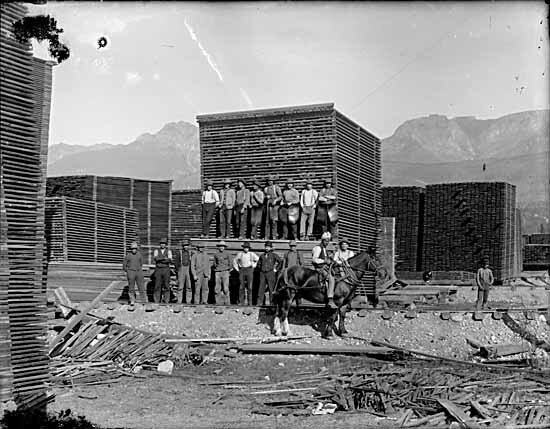 “Lumber being air dried” (1910), Vancouver Public Library Acc. No. 14264. 7-7:30 p.m. – “Early Punjabi Migration to British Columbia and the Call of Freedom (Azādī dī Gūnj)” A brief address by Sunit Singh, Ph.D. University of Chicago. Made possible by the generous support of the Sidhu family. The Harjit Kaur Sidhu Memorial Program celebrates the rich life of Punjabi language and culture and its importance in BC, in memory of Harjit Kaur Sidhu, a woman who shared such passions. Sunit Singh will give a longer scholarly talk on Thursday 17 March from 4-5:30 p.m. in Room 604, Asian Centre, UBC Campus. 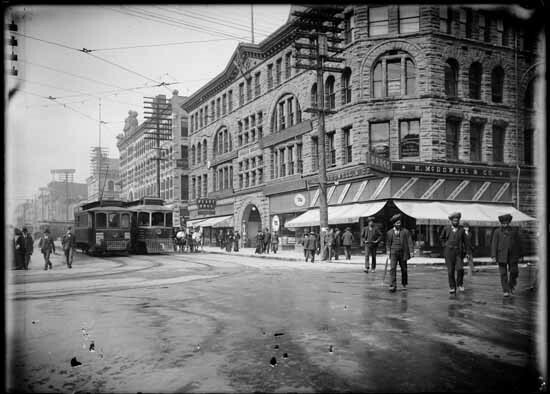 Around 1905, British Indian subjects, primarily Sikhs from the Punjab, started to venture to the western shores of Canada and the United States in search of employment. At first, Indian labor was absorbed in British Columbia, as was that of the Chinese and Japanese. Yet a forceful backlash after 1907 interrupted their welcome, when a deepening economic crisis fanned anti-Asian and anti-Indian sentiments, and established unions attempted to stem the “Tide of Turbans.” The backlash coincided with the emergence of a new spirit in the electoral life of British Columbia—the socialist party. And though generally ostracized by the unions, a small but influential group of these Indians migrants made inroads with the Canadian Socialist Party, which, after some hesitation, took up their cause. The object of this talk is to unpack how the Canadian left and the Indians themselves understood the exigencies of the labour market and the relationship of race and imperial subjecthood. For more information, see http://www.asia.ubc.ca under “events” and blogs.ubc.ca/punjabisikhstudies under ‘annual event’.